The Taylorville Kiwanis Club heard about the new Faith Bible Christian Academy in Rosamond, during their weekly luncheon Tuesday. Caleb Wheeler, principal at the school for pre-schooler’s thru 12th grade students, told the club that it started in August of 2017 after the former First Baptist Christian Academy closed at that location. Since that time, Wheeler says enrollment has grown over 50-percent to some 64 students, and the school has been recognized as an official school by the Illinois State Board of Education and the Illinois High School Association. Wheeler added the school has lots of momentum to continue attracting students for the faith-based curriculum it offers, saying the student to teacher ratio being 8 to one allows lots of one-on-one learning. Faith Bible Christian Academy’s high school soccer team won third place in the state among Illinois Christian Schools’ competition, and made it into the I-H-S-A sectionals. Wheeler said the schools’ goals include continued strong growth, lower tuition costs, and improving technology for students. 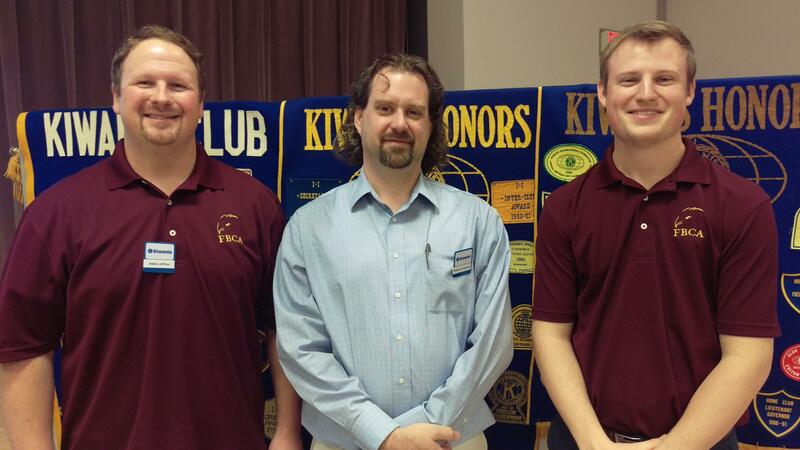 CAPTION TO PICTURE: (left to right): Adam Jeffrey, Kiwanis program chair; Taylorville Kiwanis Club president Michael Evanchak; and Tuesdays’ program speaker Caleb Wheeler, principal at Faith Bible Christian Academy.